Arnside and the Surrounding Area offer lots of things to do – both for visitors and the local community. Details of almost anything you could ever want to do as a hobby or activity can be found month-on-month on the Arnside Broadsheet (see current month’s below). The Broadsheet is a non-profit making publication in the form of a double-sided A4 sheet, published by an independent committee and funded entirely by voluntary contributions from organisations and individuals, supplemented by income generated by our other publications. It is delivered to every household in Arnside and Carr Bank by a team of volunteers. Details of ALL the individual Clubs, Group and Societies and their contact details can be found here. Friday at the W.I. Hall, Orchard Road, Arnside:  9.30 - 11.30am. Free entry. Refreshments available. The popular Arnside Country Market is every Friday until mid-December from 9.30am - 11.30  at the W.I., Orchard Road. Come along and buy home baked cakes, preserves, fresh fish, fresh eggs, home crafted cards and gifts, watercolours and jewellery. 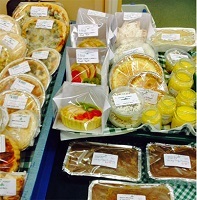 For information about becoming a producer for Arnside Country Market, contact secretary Janet Kitchen on 07974848410. Black Sheep Ukelele Band meets Thursdays at St James' Church. 6.30 for 7pm.  . Band also available for hire. 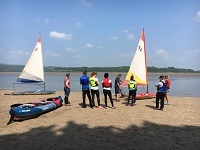 Arnside Sailing Club  offers the following Sailing Courses over the summer (April to September). Adult / Family Courses - 2-day courses at the weekends for adults and families. Cost: £85. Women's Programmes  -  Sailing Course for women over four Tuesday mornings. Cost: £85. Children's Programme  -  Free low and high tide sessions at Arnside. Four day children's courses at Killington over May Half Term and mid-August. Cost: £62 per child. Cadet Programme -  Offering regular sessions for 8 - 16 year olds from May to the beginning of October. The Heron Corn Mill, Mill Lane, Beetham  LA7 7PQ  - Something For Everyone! The last Wednesday of Each Month  -  'Crafternoons' from 1pm. A free drop-in workshop and social group held in the barn. The group is a great way for people to meet up and try new crafts, share ideas, or just have a natter and a cup of tea. The group is aimed at older people, but all ages and abilities are welcome. Weekly on Wednesdays from 1 - 2.30pm  at the E.I. on Church Hill. Reading aloud, material provided. No reading to do before or after. For further information call Julie on 01524 762538. The reserve is open from dawn to dusk daily (Closed Christmas Day). The Visitor Centre (including the shop and Cafe) is open 9.30am-5pm daily (9.30am-4.30pm December & January). Closed Christmas Day. For Families:  The Holt is open most weekends and in the school holidays. This indoor space offers interactive boards and exciting self-led children's activities. Free of charge, donations welcome. Explore our wildlife sensory garden with natures pipes, natural playpit, natures drums, den building challenge and more, come and have fun discovering all that the garden has to offer. Going exploring? If you are off for a walk on the nature reserve, get a bigger eyeful of nature by hiring a pair of binoculars from us. £3 a pair for RSPB Puffins, £5 a pair for RSPB Avocets. We also have Explorer backpacks for families including a magnifying glass, binoculars, bug pots and more. £3 a backpack, one per family. Ask at the welcome desk for details. Guided walks  If you would like a personal guided walk for you or your party, please contact us by email leighton.moss@rspb.org.uk or by phoning 01524 701413. Personal telescope demonstration  You can try out our binoculars on any day, but we can also offer your own personal telescope demonstration with one of our advisors. Please contact our Retail Manager or Assistant Retail Manager on 01524 701601 to arrange for you to go out on the reserve to see how our telescopes perform. Photography tuition  Got a digital SLR camera? Whether you're still working out your settings or seeking tips to give your wildlife shots a professional edge, you will benefit from advice, guidance and personal tuition from experienced and approachable wildlife photographer Mike Malpass. Sessions involve both indoor theory then out onto the reserve to put it into practice. Dates and times to suit you. Interested? Contact us at leighton.moss@rspb.org.uk or on 01524 701413. Talks  Looking for an enthusiastic, knowledgeable and popular speaker for your group, society or club? Our former Warden David Mower offers two excellent talks; Leighton Moss or Garden Birds. Contact him after 5 pm on 01539 563522 for details or to book. Locals wishing to know more about Morecambe Bay’s amazing waders and wildfowl should look for dedicated volunteers, out at coastal locations throughout the winter, equipped with binoculars and telescopes and sporting distinctive Morecambe Bay Partnership blue fleeces. The ‘Natural Ambassadors’ celebrate and help protect the birds and explain the importance of not disturbing the birds whilst they are ‘roosting’ (resting) or feeding, particularly two hours either side of high tide. Waders and wildfowl must eat a large proportion of their body weight to stay warm through winter and waste twelve times as much energy if flying to escape a danger, be that a human, or a dog running on the sands, than when roosting.